SMITHFIELD, Va., Jun. 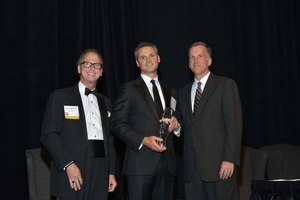 28 /CSRwire/ - Smithfield Foods, Inc. is pleased to announce that Glenn Nunziata, executive vice president and chief financial officer for the company, has been honored with Virginia Business Magazine’s annual CFO Award. The statewide award and ceremony recognizes select financial executives across a variety of business sectors. In his role at Smithfield, Nunziata leads the finance, accounting, treasury, tax, risk management, human resources, and IT functions for the company. He also serves as the principal accounting officer and is a board member of the Smithfield Foundation, the company’s philanthropic arm. Before joining Smithfield in 2015, he spent 19 years at Ernst & Young, most recently as a partner in Assurance Services. Nunziata’s extensive experience in finance, capital markets, operational analysis, internal control, and corporate governance lends to his exceptional leadership at Smithfield and success within his role. Nunziata is one of five award winners, each from companies of varying sizes, selected from 47 nominees. This year’s winners were selected by the 2017 CFO Award recipients and recognized last week at a banquet at The Jefferson Hotel in Richmond, Virginia. For more information about the event and other award winners, please visit Virginia Business Magazine. Smithfield Foods is a $15 billion global food company and the world's largest pork processor and hog producer. In the United States, the company is also the leader in numerous packaged meats categories with popular brands including Smithfield®, Eckrich®, Nathan’s Famous®, Farmland®, Armour®, Farmer John®, Kretschmar®, John Morrell®, Cook’s®, Gwaltney®, Carando®, Margherita®, Curly’s®, Healthy Ones®, Morliny®, Krakus® and Berlinki®. Smithfield Foods is committed to providing good food in a responsible way and maintains robust animal care, community involvement, employee safety, environmental and food safety and quality programs. For more information, visit www.smithfieldfoods.com. Diana Souder Smithfield Foods, Inc.